In a hydraulic lifter, a hardened steel push rod cup sits on top of a plunger mounted inside the hollow lifter body. Under the plunger is a spring that holds the plunger up so oil can fill the cavity between the plunger and lifter body. 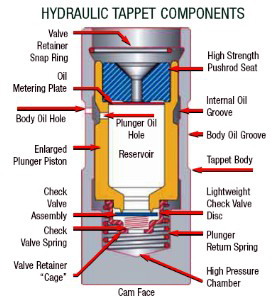 A one-way check valve in the bottom of the plunger allows oil to enter the plunger cavity but traps the oil inside when the lifter moves up. This prevents the lifter from collapsing, which would not allow it to open the valve fully. 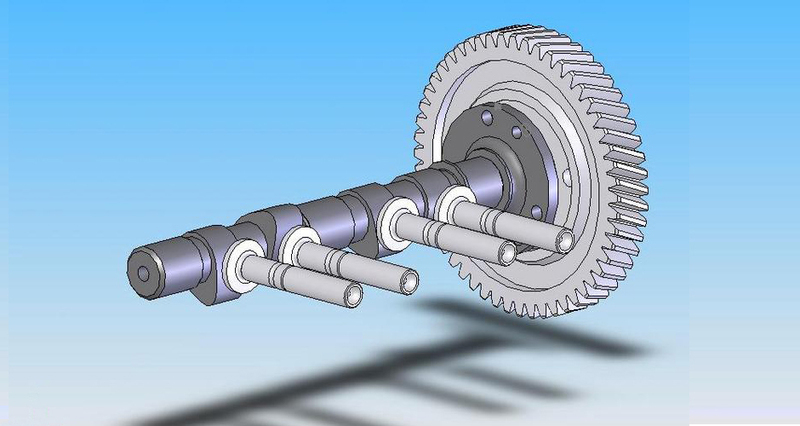 The clearance between the plunger and lifter body is extremely tight, typically 0.0002˝ or less. This is done to limit oil loss from inside the lifter (called the “bleed down” rate) when the valve opens and closes. A small amount of leakage (bleed down) must be allowed with each valve cycle so the lifter can readjust itself to maintain zero valve lash. Any change in the bleed down rate can cause a change in engine valve timing and impact engine performance. Valve train clearances change with temperature as the engine heats up and cools down, so the hydraulic lifters have to constantly compensate for thermal expansion of the crankcase, cylinders, pushrods, valves and other valve train components. By the precision matching of hydraulic lifters with identical bleed down rates to a properly profiled and matched camshaft assembly, Victor's technicians can assure uniformity of independent valve overlap timing and maximum throttle response. This allows for smoother engine operation, improved fuel efficiency and increased engine performance.